Baltimore all-weather lifeboat Alan Massey launch at 1955 hrs last night, to transfer an ill man from Sherkin Island to Baltimore. 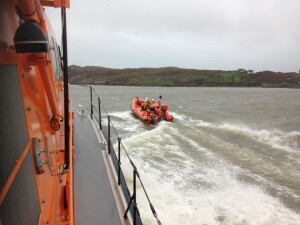 An ambulance met the lifeboat upon its return to the station in Baltimore and the patient was transferred to the care of the ambulance paramedics and the boat made ready for service again by 2030 hrs. Weather conditions were poor at the time with F7 – gale 8 in Baltimore harbour. Crew on the service were Coxswain Kieran Cotter, mechanic Mícheál Cottrell, crew Simon Duggan, Pat Collins, jerry Smith, Paul Synott and Tadgh Collins. The response time of the crew was very quick as most of the crew were attending a bi-weekly first aid training at the station.